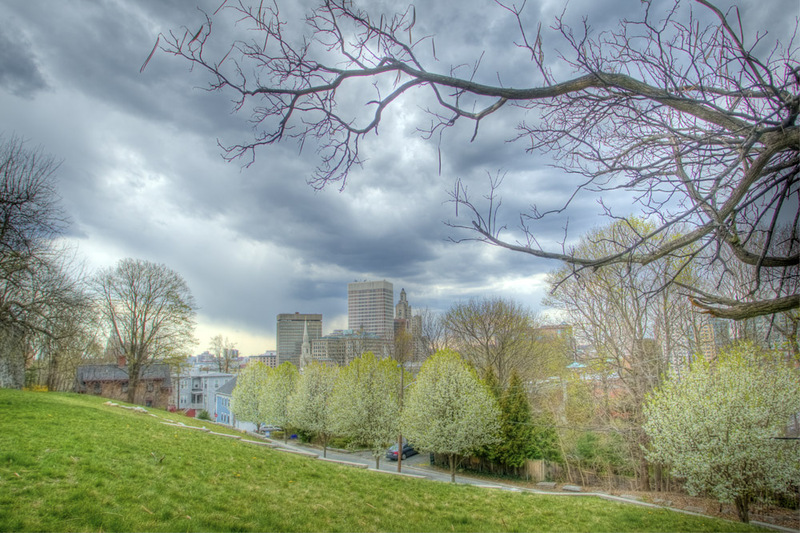 HDR of downtown Providence as springtime arrives. Springtime in New England is beautiful. Especially after a long grey winter. This year we had very little snow to cover the ground, so we were without color on the trees for a good five months. This year we had an unseasonably warm March, which lead to an early spring and blossoms. If you know Providence, they you’ve probably viewed the city from Prospect Park on Congdon St. It’s a great view, but cliche if you shoot photographs from there. This photograph was taken from just below the park on Pratt St. I love the juxtaposition of the blossoms on the tree with the mostly dead limbs framing the city as the storm clouds roll in. This is an HDR image shot using six exposures, processed in Photomatix and finished in Photoshop.